KickStart was established in Kenya in 1991 with the mission to lift millions of people in Africa out of poverty quickly, cost-effectively and sustainably. KickStart designs, promotes, and mass-markets simple irrigation pumps that smallholder farmers buy and use to start highly profitable family enterprises. KickStart has partnered with Encap Technologies to provide motors for affordable, solar-powered irrigation pumps and with Angaza Designs to incorporate a ‘pay as you go’ (PAYG) mechanism. In Kenya, solar-powered irrigation technology remains prohibitively expensive, far beyond the means of poor smallholder farmers. There is also limited demand due to lack of awareness of clean energy technology and the aforementioned prohibitive cost. KickStart’s clean energy solution will not only greatly reduce the cost of the irrigation hardware, but, through the introduction of a PAYG mechanism, will provide farmers with flexible financing options that will further promote affordability and, therefore, demand. KickStart and its partners will focus on designing a clean energy solution with the farmer in mind—a high-performance yet easy to assemble, highly mobile, robust and durable unit that requires minimal maintenance. KickStart will design a foldable, flat pack solar irrigation pump that is easy for farmers to install. As Encap’s pumps are both low cost and highly efficient, they only require small solar panels. The addition of an innovative, flexible and reliable PAYG system will provide the farmer with affordable, alternative modes of payment and, by substantially de-risking the provision of credit, will attract investment from traditional lenders such as banks and microfinance institutions. KickStart transforms the food and income security of smallholder farmers and broader rural communities by enabling the transition from rain-fed subsistence farming to year-round commercial irrigated agriculture with individually-owned technologies. The project also introduces a pay-as-you-go mechanism to provide farmers with flexible financing options that will further promote affordability and, therefore, demand. On average, farmers who adopt one of KickStart’s best-selling human-powered irrigation pumps increase their household income by 400% and over 1,200,000 people have taken a major step out of poverty as a direct result of using these innovative tools. In 2015, KickStart launched a new strategic plan to double this impact across 16 countries in sub-Saharan Africa, empowering an additional 1,000,000 people to lift themselves out of poverty while significantly expanding smallholders’ role in water management. KickStart has sold more than 300,000 MoneyMaker brand pumps to date and the introduction of the affordable solar-powered pump and flexible financing being developed through this project will be essential to both the organization’s goal and the continent’s broader need for sustainable irrigation: Currently, about 96% of farmland in sub-Saharan Africa is entirely dependent on rain. KickStart and its partners have continued the piloting for two solar PV irrigation pump prototypes and three PAYG financing platform prototypes. In FY18, 78 total systems were installed for field testing, with 58 using first-generation pumps and 20 using a second-generation pump prototype. Of the 58 first-generation pump systems, 45 are using a second-generation PAYG prototype while 13 are being financed with a third-generation PAYG prototype. These deployments add to the 21 units KickStart deployed in FY17 to equal nearly 100 systems installed, totaling 12kW of solar PV capacity. The three PAYG models being tested are based on time passed, time-used and a hybrid model combining both options. The design for their second solar pump prototype builds on lessons learned during the field and lab testing of the first-generation prototype. Across all demonstration sites and private farms, 192 adults are benefitting from the CES, 40 of whom are women. KickStart’s award has been extended to March 2019. KickStart's MoneyMaker pumps help farmers who are often barely feeding themselves to grow more crops and sell their surplus. What's next? They're planning to open an innovation hub in Kenya to develop new irrigation solutions so it can expand into 16 countries across Africa by 2021. 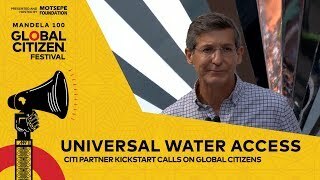 Martin Fisher, president of KickStart International, calls on Global Citizens to support the organization’s work improving access to water throughout Africa at the Global Citizen Festival: Mandela 100 in Johannesburg, South Africa. Dr. Martin Fisher, CEO of Kickstart International, an organization founded in Kenya, talks about the campaign to end extreme poverty in Africa. Kickstart International is one of the organizations highlighted at the Global Citizen Festival honoring the life and legacy of Nelson Mandela. When farmers in Uganda all plant during the rainy season, it leads to a surplus, which forces prices down. Experts like Kickstart International's John Kinaga are encouraging farmers to irrigate instead, which provides better food security, protects farmers from climate risks and reduces poverty.